Renminbi (RMB) is the only currency used in China. RMB is also called Chinese Yuan (CNY). The unit of Renminbi is Yuan and with smaller denominations called Jiao and Fen. The conversion among the three is: 1 Yuan = 10 Jiao = 100 Fen. Paper notes are issued in denominations of 1, 2, 5, 10, 50 and 100 Yuans; 1, 2 and 5 Jiaos; and 1, 2 and 5 Fens. Coins are issued in denominations of 1 Yuan; 5 Jiaos; and 1, 2 and 5 Fens. Foreign currency can be exchanged for RMB at the Baggage Hall and International Arrival Hall of the airport. You can find the relevant signs at these two places. The other easier way of getting some CNY for your taxi fare is to bring your ATM card with you. If your ATM card has a VISA logo on it, then you can get CNY cash at the many machines in the airport terminal building before heading to the taxi stands. Visa, MasterCard and American Express are most commonly used in China. Cards can be used in most middle to top-range hotels and department stores. Electricity is 220 Volts, 50 AC; plugs can be three-pronged flat pins, two flat pins or two narrow round pins. Airport Taxi: Follow the airport signs to the taxi stands. The legitimate taxis form a long queue outside the Arrival Hall (on the lower level of the building), but taxis move quickly so you won't wait long. At the end of the line a dispatcher will give you your taxi's number, which is useful in case of complaints. 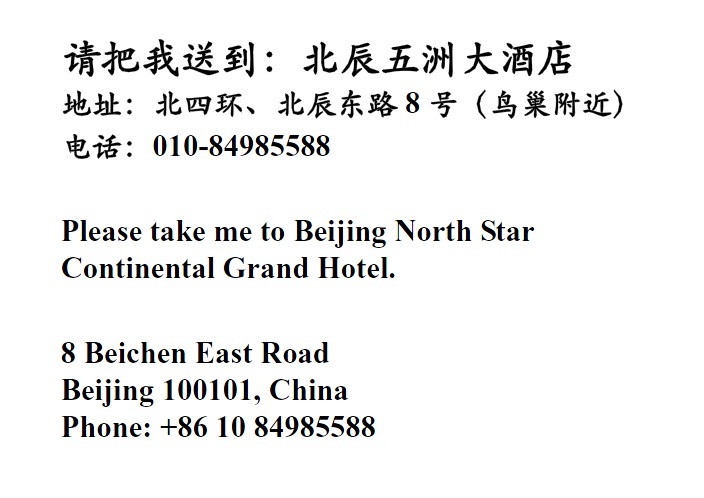 The charge will be about 100CNY from the airport to our hotel, but please pay according to the meter, plus an expressway toll of 10CNY. Click here to download a note you can show to your taxi driver. Subway: Subway is convenient for most of the time. 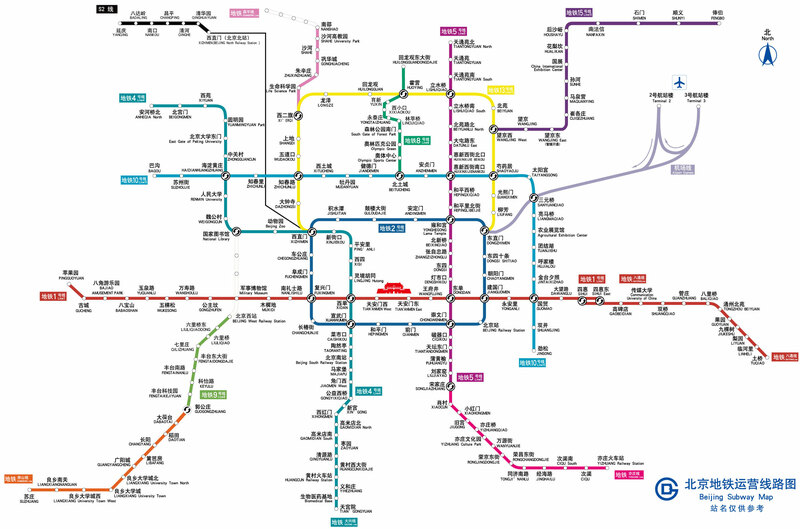 The Beijing subway map is shown here. The nearest station to the Beijing International Convention Center is the Olympic Park （奥林匹克公园）Station on subway line 8.